In December 2003, the re-envisioned Battlestar Galactica premiered on the Sci-Fi Channel. Unlike the earlier Glen Larson Battlestar Galactica, this new series quickly offered a darker fictive universe, integrating issues like government corruption, post-9/11 terrorism, the status of propaganda, religious extremism, and genocide that few other American television shows have dared to tackle in such depth. Just as the Sci-Fi Channel has endeavored to move into uncharted BSG territory with the new series, so have BSG fans charted the course. For example, female-led fanfic and icon sharing BSG communities set up on LiveJournal generate content on a daily, if not hourly, basis. These fanfic communities have attracted much attention in recent years as media scholars study fans’ innovative work. However, other BSG fans find their creative outlet in another format: the wiki. Unlike the online fanfic communities, the few BSG wiki communities — most notable of which is a group of twelve-hundred-plus users on Battlestar Wiki — tend to be heavily male. The Battlestar Wiki collects and catalogs ships, spaces, characters, and vocabulary related to Battlestar Galactica: a series that’s own diegetic world collects and catalogs everything from missing colonists to Cylons to all information about Earth. (Interestingly, these common practices in data collection, both to remember the past and to gain a better knowledge of the future, cross from Galactica’s memorial hallway to Battlestar Wiki’s online articles.) Through the reappropriation of images and an almost encyclopedic knowledge of all things BSG, fans on the Battlestar Wiki gain ownership by unhinging parts, rebuilding texts, and re-exhibiting the series online. While wikis are popularly understood as stemming from a “collective impulse” (i.e. gathering “just the facts”), I’ll explore the Battlestar Wiki to address its users’ “creative impulse” as well as to consider how gender may or may not impact the generative activities surrounding wiki construction. Observations of gender divides forming around reading practices and fan community construction are by no means new. In 1986, reader-response critic David Bleich surveyed how male and female students read canonical literary texts. He concludes that the men that he studied tended to read for authorial meaning, noting a “strong narrational voice” shaping the text, whereas the women “experienced the narrative as a world, without a particularly strong sense that this world was narrated into existence.”1 Bleich also observes that female readers saw their own “tacit inferences” as part of the story, whereas men disregarded such inferences and focused more on textual “accuracy.” Henry Jenkins (1992) adopts Bleich’s conclusions, translating them from the literary to the televised with his comparison of female Star Trek fans with male Twin Peaks fans.2 Jenkins suggests that while the two communities’ activities parallel one another, as each engages in repeated re-readings of common narratives and draws on secondary texts for added information, differences still appear. To summarize, Jenkins notes that women read Star Trek associationally, looking for interrelationships between their lives and the characters’ lives, while men read texts linearly, looking for additional information from characters and their relationships to resolve their own syntagmatic questions concerning plot development. Jenkins’s and Bleich’s conclusions, however, focus more on finding gendered differences in fans’ applications of texts, rather than looking at one important commonality: all fans studied are interested in better understanding characters and relationships in order to answer their own questions about the text. To bring this back to the Battlestar Wiki, male wiki contributors likely watch the series with the same interest in Lee Adama’s marriage or in the latest new clue toward finding Earth as female fanfic writers; however, wiki contributors choose to add a stub rather than write a drabble. In both cases, fans build off the text by creating their own versions of characters, plot points, or story arcs. In addition to reading strategies, a sense of identity and “belonging” also plays an important role in online community construction. In a study of children’s social networks and fandom in southeast England (2002), Suki Ali looks at how reading strategies are used by friends in the process of formulating ethnic and gendered identifications. She finds that the notion of “belonging” to a particular social circle influences tastes and media consumption. Rather than thinking about group organization as “like finds like,” Ali suggests that children become like and “like like” because of social pressures to belong to a specific group.3 Although this conclusion resembles the traditional concept of “peer-pressure,” if we take Ali’s findings into adult fandom, they point to a process of media consumption based not only on personal tastes but the tastes and suggestions of online friends (or prospective online friends). Television fan communities thus can be formed partially through a sort of prosyletization process in which one “converts” or “is converted” into both a fan and a member of a specific fan community. Further, one may be “converted” into a fan of technological formations themselves: that is, online community members become taken with a technology just as much as they’re taken with a text or an online buddy. Ali’s concept fits with the crossover between the popular Wikipedia and the lesser-known Battlestar Wiki. Once one learns a particular platform, for example, it becomes easy to participate in other incarnations of that digital format. Those Wikipedians who assiduously filled out the original Battlestar Galactica entry thus likely went on to participate in the Battlestar Wiki and other wiki communities as well. 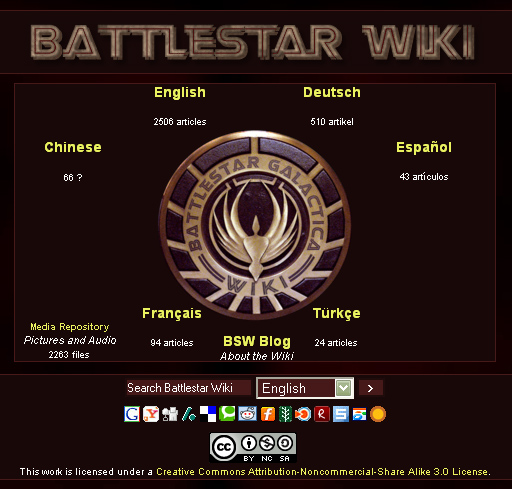 In practice, the Battlestar Wiki community formed not necessarily because of a common reading strategy, but because of a devotion to the BSG text and the wiki format. These instances of inside jokes on the wiki suggest a more dynamic community generating this content than, say, occurs with Encyclopedia Britannica. The toaster entry displays users’ attempts not only to construct meaning and order for the BSG text, but it also shows users drawing interrelationships between the text and their everyday lives to create a “hybrid toaster,” which is half fantasy-robot-soldier and half common-American-kitchen-appliance. This layering of texts therefore does something very different than a conventional encyclopedia: it intentionally complicates an entry rather than providing “transparent” clarification. 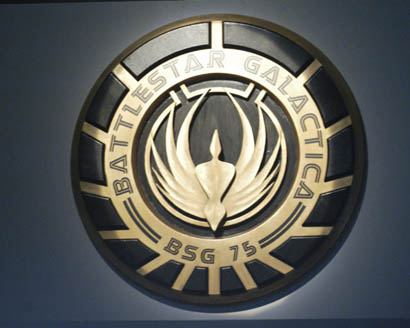 The general goal of most wiki contributors, however, is not to draw connections between the text and real life but to catalog and clarify all things BSG. Unlike much fanfic that speculates on what happens before or after a particular episode or show ends, wiki users cast their nets wide, creating thousands of short articles. Their work, therefore, initially resembles less the creative process of an MFA graduate and more the indexical aim of librarian. Each BSG episode, for example, is given its own page complete with sub sections. The “Downloaded” episode contains eight sections, including: “1 Overview, 2 Summary, 2.1 Teaser, 2.2 Act 1, 2.3 Act 2, 2.4 Act 3, 2.5 Act 4, 2.6 On Galactica, 3 Notes, 4 Analysis, 5 Questions, 6 Official Statements, 7 Noteworthy Dialogue, and 8 Guest Stars.” Furthermore, in “Downloaded,” a Number Three introduces the verb “to box.” Shortly thereafter, someone created a “Boxing” entry on the wiki, complete with specific examples, images, and a disambiguation clause differentiating between “boxing a Cylon” (downloading a Cylon’s consciousness into cold storage indefinitely) and a “boxing” match (the combat sport). Users’ attention to detail causes the wiki to resemble the “fact-based” Wikipedia or traditional encyclopedias. Yet, it’s important to remember that the Battlestar Wiki collects “facts” about a fantasy series. The character biographies, episode summaries, and noteworthy dialogue stem from fan speculation as users choose and edit their favorite BSG highlights. While users reserve the wiki for publishing “facts,” they’ve established another space to catalog fans’ parodies and satire. The Wiki Frakr is “a mockapedia, an encyclopedia dedicated to mocking and having fun at the expense of Battlestar Galaxitive.” Making light of the wiki format as well as the often dark BSG universe, the Wiki Frakr exists separate from the official wiki, allowing allows contributors to speculate wildly on the series outside the Battlestar Wiki’s indexical aim. The humor, however, which includes an index of “notable b00bz in BSG,” embraces male heterosexuality often at the expense of female or potentially queer characters. Here, a search for “queer” reveals an entry for Felix Gay-Duh (a poor pun on the character Felix Gaeta’s last name). While the Frakr thus was established to be a generative play space for fans, it operates as a segregated space, keeping “what’s creative and funny” off the Battlestar Wiki’s “fact-based” pages. While the wiki does not include fanvids or drabbles, Battlestar Wiki users write about beloved characters, items, and practices. In fact, they interact with BSG not just through what Bleich or Jenkins might call “collecting,” “mastering,” or “conquering” a text, but through a generative process requiring both an intimacy with the text and a creative drive. Unlike the common assumption that the wiki is seen and used as an introductory reference source, wikis and other archival systems in effect produce modes of thinking through how they define “fact.” Julia Martin and David Colman remind us that the archive is “a living ecosystem, where information and its delivery systems are recognized as dynamic, highly changeable, and inhabited by humans.”5 The wiki as an ecosystem is created and maintained by fans of the series and should be viewed as a changing site of opinions and observations rather than a static reference tool. Thinking about the wiki as fundamentally generative brings the Battlestar Wiki much closer to fanfic and other the creative endeavors classified traditionally as “female fan initiated.” Still, while the Battlestar Wiki provides a site for subversive narratives, the community tends to adhere to a “just the facts” approach. This, however, may not derive from strict Battlestar Wiki community boundaries as much as from how Battlestar Wiki users, and wiki users more generally, see the wiki itself. Rather than being viewed as a tabula rasa to be filled and edited by fans, wikis have been seen and used largely as online encyclopedias (likely due to Wikipedia’s popularity). Thinking about the wiki as a space always created and maintained by people could significantly change not only popular understandings of wikis and how they work, but also the makeup of wiki communities and the type of content ultimately produced. As online technologies like the wiki continue to develop, fans seeking to update and preserve texts will be faced with a growing number of options. Conceptualizing the content they create not simply as a “fact based” reference tool but as a changing, dynamic text in itself will help establish more diverse uses for the growing array of formats as well as draw important connections between communities, content, and modes of delivery that may initially appear dissimilar and even contradictory, thereby opening up even more possibilities for thinking through and across techno-cultures and texts. Sarah Toton is an American Studies PhD student in Emory University’s Graduate Institute of the Liberal Arts. Her research interests include media studies and twentieth-century American popular culture. 2. Battlestar Wiki front page, screen capture provided by author. 3. 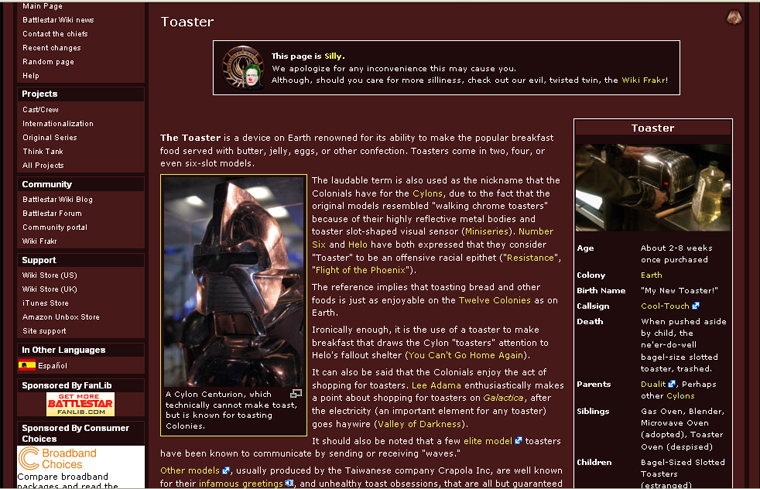 Battlestar Wiki entry for “Toaster,” ibid. 4. Battlestar Wiki search results, ibid. Without intending to detract from the article’s standpoint, I’d like to point out that Battlestar Wiki contributors wrote two articles on sexuality (one for the Original and one for the Re-imagined Series) some two weeks ago. Searching for “queer” and related terms points users to these articles. Regarding the sexuality articles, it should be noted that this article was written before I wrote those articles on the Wiki. Thanks for the interesting article, Sarah. However, there are specific points where it seems that your article is either trying to lead the reader, or mislead. A wiki, by definition, is an encyclopedia, which should not exhibit any kind of fictional content (even when documenting a work of fiction). The policies and contributors of Battlestar Wiki strive to summarize all aspects of the episode contents, its casts and crews, merchandise and the like. What strongly and permanently differs Battlestar Wiki from fan fiction is that (1) Battlestar Wiki does not allow fan fiction of any kind, and (2) the wiki requires that any speculation on the motivations of characters or purposes and uses of technology, for instance, must be supported by an aired element of the story, as works of fiction often do not fully explain the “how” or “what” of an object or a character’s motivation. Unfortunately, I don’t understand the conclusion drawn. Gathering and depositing data, provided that rules are defined that limit interpretation, subjectivity, source matter and point of view, isn’t a gender-specific matter. Anecdotally, I find far more females enjoy and write fan fiction in my circle of friends. I personally find fanfic distasteful because it can taint the writing from the official sources and, frankly, is a little rude. It seems to me that comparing the encyclopedic nature of Battlestar Wiki to fanfic is like comparing a book to clay. They have different and very specific purposes. I agree that the two seem to have a gender contrast, but that’s about as I far as I’d go. Again, thanks for the article. improve to create much more power when performing exercises. It is manufactured in a Fda approved lab and what is interesting is that it can be purchased lawfully devoid of a prescription.